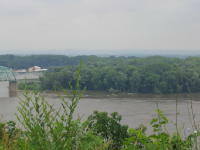 A panorama of the mighty Mississippi, taken while traveling the "scenic route" on our way to Hannibal, MO. Helene's software stitched together seven separate shots to create this. This is one of the islands that are mid-river. 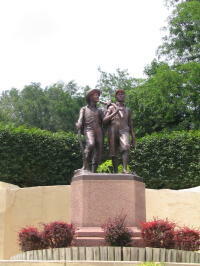 Hannibal, MO was Mark Twain's boyhood home. 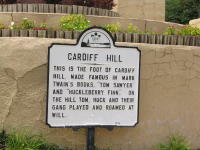 The town has posted markers at sites that replicate locations in his books.